Baked Mac and Cheese is the ultimate side dish for any meal made with three cheeses, this classic is perfect for the holidays and for summer cookouts! Add the butter to a large stockpot and melt on medium-low heat. Add the flour, mustard, cayenne and paprika and whisk together until fully combined, cook for an additional 15 seconds. Add the milk slowly while whisking to keep the mixture well combined. Add in the salt and pepper and cook for an additional 5 minutes. Remove 1 cup of the milk mixture and let cool for a 3-5 minutes in the refrigerator in a larger glass measuring cup or bowl. Add the egg to the cooled milk and whisk it well until fully combined. Turn the heat on the pot back on to medium-low. Add in the Monterey jack, mozzarella and 1 cup of the sharp cheddar and whisk until combined. Add the cooled macaroni back into the pot and toss with the cheese sauce. Pour into a 9x13 baking dish and top with the remaining 2 cups of shredded cheddar cheese. 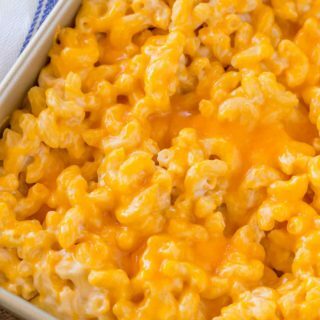 * I use blocks of cheese for my mac and cheese because shredded cheese is coated in a powder that prevents the cheese from sticking to each other. This also results in cheese that may not melt as fully and result in as creamy of a texture as we'd like. ** Removing the cup of milk, cooling, then adding in the egg allows for us to temper the egg which prevents it from immediately scrambling in the hot milk mixture.